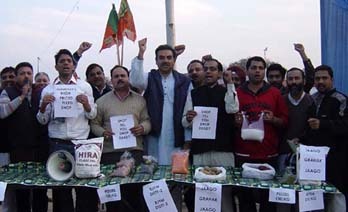 The BJP has blamed the UPA for its “wrong” economic policies and corruption, leading to steep price rise and said Prime Minister Manmohan Singh has to answer for this. “The UPA has been voted to power twice. They have not only failed to fulfil the promises made but also indulged in corruption leading to price rise. There is anger in the hearts of the people,” BJP president Nitin Gadkari told a party rally in Dibrugarh (Assam) on Tuesday. He said the Supreme Court had directed the Congress government to disclose the names of those having accounts in foreign banks but it refrained, saying it was not in the national interest. “We fail to understand how revealing the names of those, who have cheated the poor of the country by avoiding to pay different taxes and have stashed the black money in foreign banks, is against the country’s interest,” he said. A Planning Commission report has pointed out that nearly 90 percent of the country’s population earns less than Rs 20 a day while another section earns Rs two crore a day through corruption. “Living for the common people has become very difficult. Price rise has led to suicides, unemployment and this is not related to anybody’s caste, religion or language. How will the poor survive in such a situation?” Gadkari asked. He said the country has witnessed a series of scams involving the Congress and its allies. The Congress claims its mission is ‘Garibi Hatao’ (poverty eradication) but whose ‘Garibi’ has it succeeded in removing. Statistics prove that the rich have become richer and the poor poorer, he said. Gadkari alleged that the poverty of common Hindu or Muslim, Adivasi or Vanvasi people has not been removed. It is rather the Congress leaders and workers who have become richer. He said the Congress government at the Centre alone was not indulging in corrupt practices. The Assam government headed by the party too was doing the same “and there is a long list of scams to prove that it is following the same path as the Congress at the Centre”. Former Asom Gana Parishad MP Sarbananda Sonowal joined the party at the rally. With Assembly elections in Assam barely a few months away, Gadkari said he could foresee poor voters being offered not only food and clothes but also costly items like mobile phones, besides hard cash in return for votes. “We are against Bangladeshi migrants who usurp land and source of income of locals. Can you enter Bangladesh and buy land or property there? The Congress has deliberately kept the borders free to allow Bangladeshis to enter and vote for them,” he said. The BJP president lauded the people of Assam for carrying out a movement for six years to free the state from Bangladeshi migrants. “There is no such struggle in the history of the country. We cannot forget history and salute the martyrs who made immense sacrifices. The Assam Accord was signed but not completely implemented due to vote bank politics of the Congress,” he alleged. Gadkari assured the people that BJP was committed to fully implementing the Assam Accord and provide equal opportunities for all. “We assure all that BJP is not indulging in any communal or Hindu-Muslim politics. Whatever your language or religion is, if you are an Indian, then all are same for us and we want your development and progress,” he said. Gadkari pointed out that people of Assam want a corruption-free government where development, employment, educational institutions, hospitals and tourism facilities are available. “We are not in politics to become MLAs, MPs or ministers but our mission is to eradicate poverty and ensure development along with good governance,” he said, adding, this is only possible in a corruption-free government. Welcoming Sonowal in the party fold, Gadkari announced that the former students’ union leader has been made a member of BJP’s national working committee.